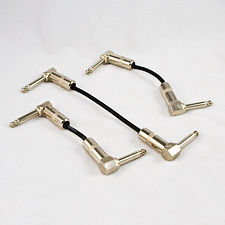 PCNS Pedal Board Cable KIT. This "do it yourself" bulk cable & plug Effect Patch Cable KIT is available with 90 degree or straight 1/4" G&H connectors and with very flexible 22 gauge Canare GS4 Instrument cable. 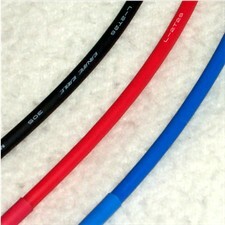 Small 4.0mm outside diameter cable with a very transparent sound. Please choose cable length, shrink tube color & length and quantity of straight or right angle connectors. This is for the "do it yourselfer" who likes to build their own cables. These are soldered connectors with this kits. If you are not able to solder do NOT order this kit. Note: This is a do it yourself kit not finished ready to use cables. Cable comes in the length ordered and will need to cut and stripped before assembly. Cable is only available in black. 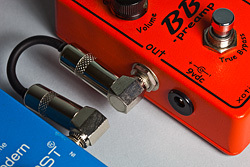 Our Pedal Board Cable plug and effect pedal jack cleaning kit is a must have for any musician wanting long term sound quality and durability out of their pedal board, effects pedals or instrument cables. CAIG is an instustry standard in electronic cleaning products. This kit includes 6 CAIG individual cleaning wipes and 2 multi use CAIG cleaning brushes. Ultra IC00P GS4 Effect Patch Cable available with 90 degree or straight 1/4" connectors and with very flexible 22 gauge Canare GS4 Instrument cable. Small 4.0mm outside diameter cable with a very transparent sound. Please choose length. Only available in black cable with black shrink tube. NEW OPTION! Upgrade to Gold and Black G&H plugs! NOTE: Quantity Discount will apply even if you add 5 or more different optioned cables to the shopping cart!